Sometimes you just need some cake, you know? It’s been a weird few days. It snowed in Alabama last Tuesday and screwed up the entire week. People in Alabama don’t know how to handle snow. Not surprising! But a large majority of people in Birmingham ended up having to sleep at their work or in random places because all of the roads literally shut down. Some people couldn’t get home for two days! Because of two inches of snow. There were insane stories about people getting stuck in a-million-car-pile-ups, the interstates looked like an apocalypse happened (those are all abandoned cars, btw), and kids all over the city had to stay the night at school because their parents couldn’t get to them. Plus I had the worst cold of my life and no medicine. I really can’t complain though, because I was able to sleep in a bed and not on the floor of my cubicle. Or my car on the side of the road. I learned who I can and cannot count on in situations like that. (Funny how that happens, right?) I learned that I should not try to drive in the snow! I learned that if I’m sick enough to feel conflicted about whether I should go to work or not, I should stay home. 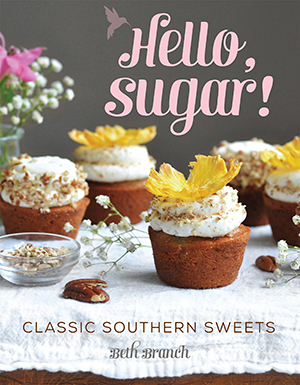 And I learned that, yes, the Southern Living test kitchens really do know how to make some serious biscuits. By the time the weekend came, I was still going through boxes of tissues like it was my job, and I figured I would probably feel better after lounging around the house in my pajamas for two days. And after some cake, obviously. I wanted to make another Valentine’s-themed something, and also got some inspiration for this cake from a cupcake from a local bakery here called Dreamcakes. I’ve only been there twice, but the first time I got a chocolate cupcake with strawberry frosting and it was delightful. When I worked at Gigi’s Cupcakes in college, there were two strawberry cupcakes and I could have eaten one everyday. 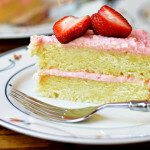 Strawberries and cake just work. This is a 6 inch cake, which might not be obvious in the pictures. I didn’t need a large cake in the kitchen while I shut myself inside all weekend, you know? 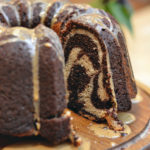 It’s adapted from my all time favorite chocolate cake recipe, Dark Magic Cake. 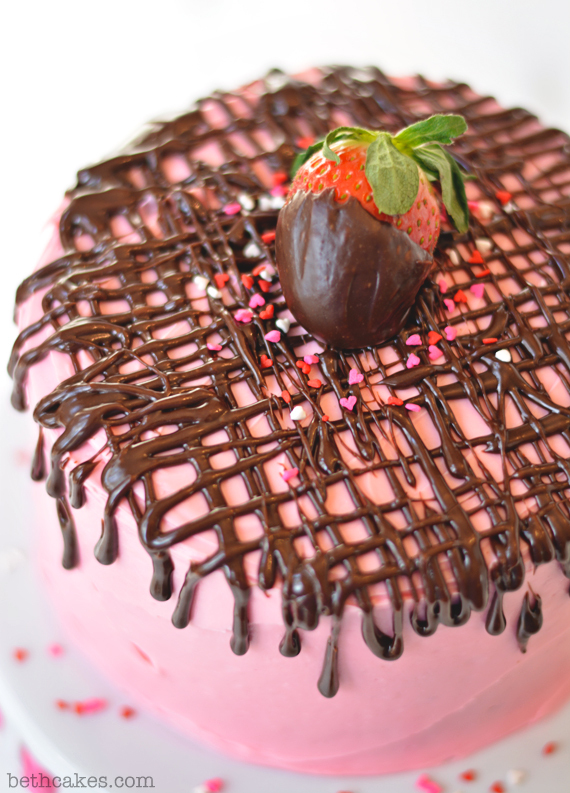 Then I covered it in strawberry frosting, (ate some strawberry frosting), drizzled it with chocolate ganache, (and ate some chocolate ganache). I realized after I pureed some strawberries and then boiled the puree down to a little less than 1/4 cup that I’d basically made strawberry jam, so you can just use strawberry jam if you want. Sometimes I don’t think things through. 😉 I’m not even going to tell you about how I didn’t wait for my ganache to cool before drizzling it on my cake and had to refrost it. Or about how the lid of the squeeze bottle I was using to drizzle the ganache (the second time) exploded off the bottle and got ganache everywhere. I blame all the cold medicine! Preheat oven to 350 degrees and line three 6 inch cake pans with parchment paper. Spray pans with nonstick spray. In a medium sized bowl with a handheld mixer, mix sugar, oil, and vanilla. Next, add the flour and buttermilk. Mix slowly at first, and then on medium speed until combined. Add the cocoa powder, baking soda, baking powder, and strongly brewed coffee. Mix until incorporated. Divide batter between the three pans and bake for 25 minutes. Remove the cakes from the oven and insert a clean toothpick into the center of each. If the toothpick comes out clean, they're done. If not, put them back in the oven for about 2 minutes. Once they're done, let the cakes cool in the pans for 10 minutes, and then move them to a wire rack to cool completely. Cream butter in the bowl of a stand mixer on medium speed until smooth and creamy. Add strawberry jam and mix well. The frosting will probably be a pale pink color, so you can add a little pink food coloring if you want. Using an offset spatula, frost the cooled cake layers. In a heat-proof bowl over a pot of simmering water (or double boiler), add chocolate chips and 3 tbsp of cream. Stir frequently to keep chocolate from burning. When chocolate is almost completely melted, remove from heat and stir until completely smooth and melted. If the ganache is too thick to drizzle, stir in another tablespoon of cream. This looks delicious and pretty! How much buttermilk is needed? Oh, sorry about that! It’s 1/2 cup. Oh my gosh Beth this looks gorgeous. Your photos are so beautiful and I love all the chocolate fudge on top of the cake it is so pretty. 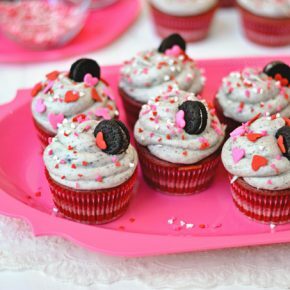 What a fun idea and perfect for Valentine’s day! 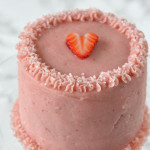 I love that this is a smaller cake – smaller desserts are always the cutest! My recipe today is very very similar! We must have been on the same wavelength while we were baking away! WOW. This is absolutely beautiful! And I’m sure it tastes fantastic too! What a beautiful cake! So festive for Valentine’s Day. I love it! 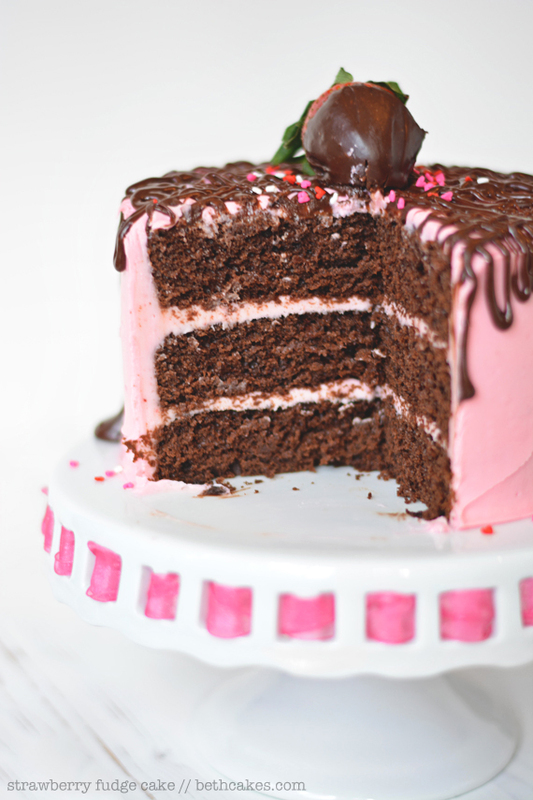 Everything about this cake is perfect! I am in love with all that ganache coming down the sides, what a beauty. Thanks, Pamela! The ganache has got to be the best part in my opinion! Gorgeous cake!! And totally acceptable for breakfast : ) I wish I had a slice for tomorrow morning … or tonight, that would work fine too. 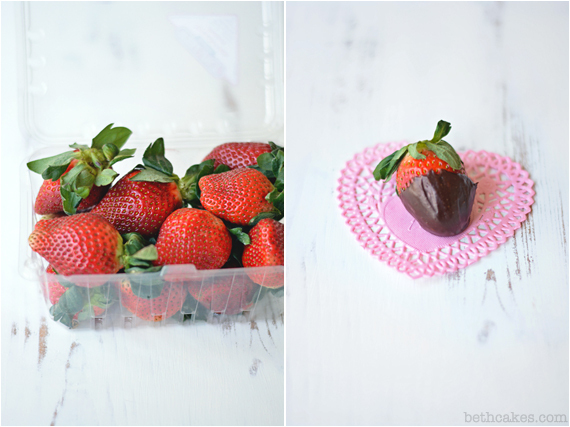 Love the chocolate / strawberry combo – it’s such a good one! What a beautiful cake! 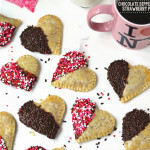 All of these valentines recipes are making me wish I lived near my boyfriend so I could make something for him! LOVE the drizzles of chocolate the best! Thanks! I’m glad you liked it and I agree. Strawberry is just as good! Sounds like some crazy weather you’re having! Good thing you’re not office bound so you can make delicious cakes like these. 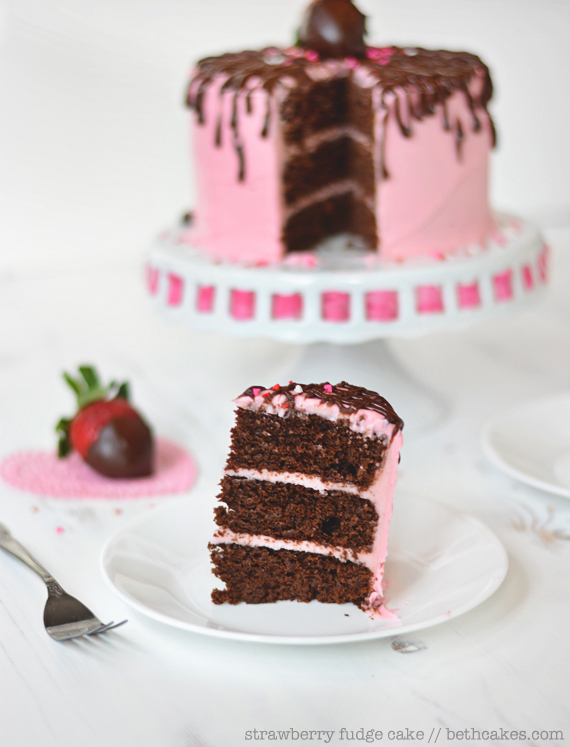 Strawberry and chocolate definitely has to be one of my favourite flavour combinations so I would love a giant slice of this right about now! Wow Beth. 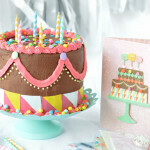 You’ve outdone yourself with the beauty of this cake! I love the strawberries and chocolate fudge on top. Love the design! Beautiful beautiful cake!! 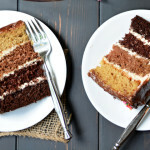 Just love the flavor combinations and how the cake looks. Oh also, I am having a similar weekend. A cold with no medicine helping, reaching for the tissue box like its my job and 10 inches of snow outside. Not a fan but I am sleeping lots at odd hours. Thanks so much, Zainab! Gosh, I can’t even image 10 inches of snow, haha. We just had two and I hated it. I hope you feel better soon! Yes, it was crazy! Two inches really isn’t much, we just don’t know how to deal with it here, haha. Thanks, Jocelyn! I have been driving in snow all my life, learned to drive in the snow. It’s crazy to me that people literally can’t just SLOW down and drive. I can’t image what the scene was like for those that were stuck on the highways for days. On another note- GORG cake. Thanks, Julianne! Yes, I think if people would have just driven slow it wouldn’t have been that bad. But people just don’t know how to drive on snow here, haha. The cake looks AMAZING! 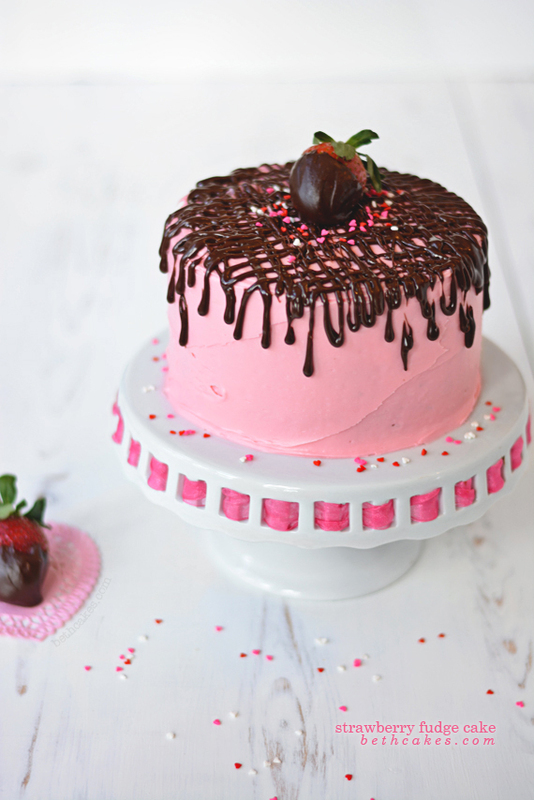 Love the chocolate and strawberries- absolutely divine! As a WI resident, I got a kick out of the calamity that 2 inches of snow caused. I feel bad for the people where were trapped though–if only they had this stunner of a cake to look forward to at home! Seriously Beth, it is BEAUTIFUL! Thanks, Erin! It was pretty ridiculous. We just never have that much snow! haha. Thanks so much! Yes, we are aware that we have no clue what we’re doing when it comes to snow, haha. It was the first time I’ve ever driven on it! Craziness, haha. Thanks, Erika! And as for the new storm, I’ve been hearing about it all day today! I hope y’all are safe there! This is a gorgeous cake Beth!! Love it. I’m so into anything with strawberries and chocolate. Pinned! This cake looks fantastic!! Yum! Can I say how much I adore your header? So cute! Wow!! This looks AMAZING!! So beautiful and perfect for Valentines Day!! YUM! This is such a pretty and elegant cake! And your pictures are stunning!! I always need cake, especially today!